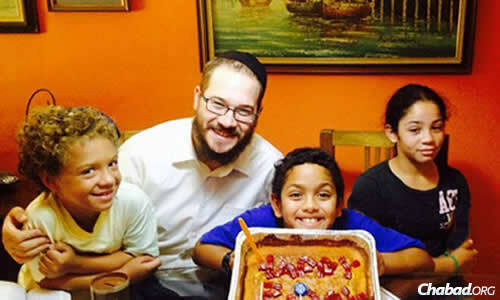 Rabbi Yaakov Raskin celebrates a birthday with Jewish children who attended a newly formed day camp in Jamaica this summer. With nearly 400 years of Jewish settlement, Jamaica is poised to turn a new leaf in the annals of its Jewish history, with the arrival of its first-ever permanent Chabad emissary couple. Chabad’s presence on the island has a long and storied history, dating back to the summer of 1957, when young rabbinical students Yehuda Krinsky and Leibel Raskin had been sent by the Rebbe—Rabbi Menachem M. Schneerson, of righteous memory—to bring Jewish publications and awareness to Jamaica, Puerto Rico and the Dominican Republic. In his report to the Rebbe, Raskin described a Jamaican Jewish community that was thirsting for Jewish teaching and services, but lacked kosher food and other basic infrastructure. 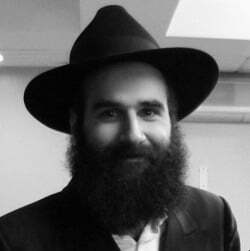 Shortly thereafter, Rabbi Krinsky went on to serve the Rebbe directly; today, he is the chairman of Merkos L’Inyonei Chinuch, the educational arm of the Chabad-Lubavitch movement. Rabbi Raskin, who passed away in 2004, became the Rebbe’s emissary to Morocco. Nearly 60 years later, Jamaica has become the ninth Caribbean island to have its own full-time Chabad presence, as Rabbi Yaakov and Mushkee Raskin—married for just a year—prepare to relocate and jump-start Chabad of Jamaica in time for the High Holidays. Following their marriage in August 2013, the Raskins began to consider Jamaica as a place to found a Chabad center of their own. After a discussion with Rabbi Moshe Kotlarsky, vice chairman of Merkos L’Inyonei Chinuch, and Rabbi Mendel Zarchi, founder and spiritual leader of Chabad in Puerto Rico and the point person for Judaism in the Caribbean, the two planned their first trip together to scout the island out in the spring of 2014, with the guidance of Mushkee’s parents, Rabbi Zushe and Esther Wilhelm. 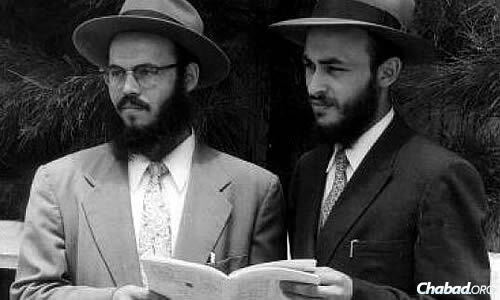 Rabbi Leibel Raskin, left, and Rabbi Yehuda Krinsky in Jamaica in the summer of 1957, where they were sent by the Rebbe. Hearing about a Jamaican Jew with ties to Great Britain named Raymond Doweck, who kept kosher while living in Kingston, the couple decided to set up a meeting. When they called his home, they were dismayed to discover that he had a stroke that very morning. Upon arrival in Jamaica, they went directly to his hospital room and were saddened to learn that Doweck did not appear responsive to their conversation. Much to the delight of his family, he did, however, perk up somewhat when the rabbi would strap tefillin upon his arm and head. 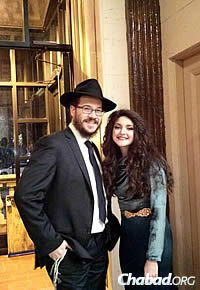 Shortly thereafter, they met Doweck’s niece, Debby Flacks, whom it turned out that the rabbi knew, as the two had met at his sister’s Chabad center in Monaco. Flacks and her husband, Michael, attend regularly when they are in Monte Carlo. Jewish events first took place at the Kingston home of the late Raymond Dowek, who managed to keep kosher on the island. As the weeks progressed and Doweck’s situation continued to deteriorate, the Raskins maintained steady contact with the family, offering prayers, support and even kosher food for those in Jamaica attending to his needs. After learning of Doweck’s passing, Raskin decided to attend his funeral in Israel. There, appreciative family members offered to help fund Raskin’s fledgling Chabad center as a tribute to Doweck, whom they say had always wanted a Chabad House on the Island. 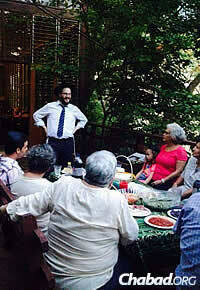 As per the family’s wishes, when the Raskins returned to Jamaica this summer for a second visit, they used Doweck’s home as a temporary Chabad House, in which they hosted meals and celebrations. At the same time, they also held a day camp for half-a-dozen local children, combining education (Torah study) and entertainment for a well-rounded Jewish experience. The summer also offered them the opportunity to begin supplying kosher food to locals and tourists alike—a need that has been sorely lacking. And they used the time to search for a home for their Chabad center in Montego Bay. While most of the Jewish residents (as well as the community center, United Congregation of Israelites) are concentrated in the capital city of Kingston, the Raskins chose to put down roots in Montego Bay; it’s a haven for tourists and has recently been connected to Kingston with a new highway, cutting down travel time between the two population centers. They plan to make the trip to Kingston every week or two for Torah classes, children’s programs and other Jewish services with the local community. 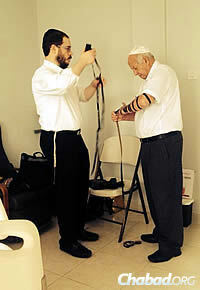 Rabbi Raskin wraps tefillin with Raymond Doweck's brother, Albert Doweck. With their new home secured and their household belongings in transit, the Raskins are concentrating on the High Holidays, taking reservations and drumming up interest for services and meals for tourists and locals alike. So far, they have made contact with about 70 Jewish households, and the numbers are climbing steadily. In the short time since their arrivals, they've established a synagogue with regular Shabbat prayer services both Friday night and Saturday morning and even daily services during high tourist seasons. 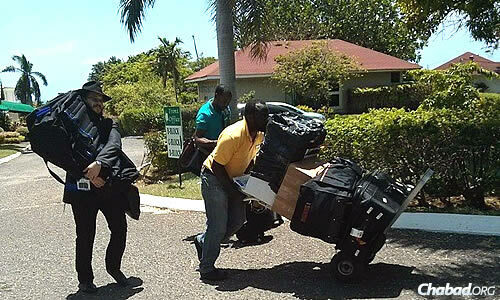 The rabbi brings a Torah to Jamaica, carrying it to the new Chabad center. May you have much hatzlacha and bracha!!! Kesiva v'chasima tova shanah tova umesuka!! !